We work with individuals seeking a high level of service who want a long-term relationship with an advisor that they trust to help them reach their financial goals. We translate information into understanding. Using a carefully structured process, we help our clients focus on clarifying their objectives. We have substantial experience working with a diversified group of people, each with unique ambitions and needs. Individuals experiencing a major life event often come to us and it may be their first time meeting a professional to talk about their financial future. We have the knowledge, experience and understanding to address your unique needs. Here are some of the clients we serve, what they care about and how we help them. After a lifetime of scrupulous earning, saving and investing, retirement can be a welcome change. But it also can be a source of practical and emotional stress as you assess how to preserve as well as spend your hard-earned wealth. 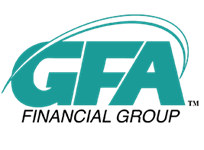 GFA Financial has particular expertise in helping you move confidently into the distribution phase of your financial planning, assisting with the logistics of balancing lifestyle spending with protecting and/or growing assets in retirement, as well as preparing for legacy and/or philanthropic goals. Prior to retirement we help you tie up myriad loose ends such as cash-flow needs, investment planning, tax management and advanced planning as necessary. Losing a spouse is devastating. Especially if you are new to the role of taking care of family finances, it only adds to the stress, as you are called upon to administer accounts, search for life insurance information and face a myriad of other decisions while you grieve. Even if you have been responsible for the household wealth, greater concerns weigh heavy on the mind. We help alleviate the financial planning burden for surviving spouses. As your objective advisor, we’ll champion your overall interests - listening, caring, protecting and supporting your and your family’s financial needs. We’ll help you determine which financial decisions can – perhaps should – wait. Some longer-term decisions are best postponed until after you’ve regained your footing. We’ll also help address concerns that demand immediate attention. For these, we’ll roll up our sleeves to assist. We’ll help with difficult phone calls to locate assets and accounts, explain the jargon in meaningful terms, and generally remain at your side, as your go-to resource in the face of the unfamiliar. Families with three to four generations of family members are carefully thinking through distribution of their wealth within and outside their family. We are there to help them make the best possible decisions. Many family business heads are thinking through how best to transition leadership of their enterprises in the most seamless way possible to other family members or to a new owner. We act as their financial resources advisor. Some professionals are so engaged in their work and life that their financial resources aren't aligned for the best possible outcome. Once we create a plan with them, they can focus elsewhere with the reassurance that we will faithfully execute the new plan. The chairperson and their board want to ensure that their investment approach aligns to the foundation's mission. We serve the top executive and the investment committee to help make the best holistic decisions they can for the benefit of their organization and those they serve.